Hello! At this point you may be wondering what I’m working with here. Well let me show you. 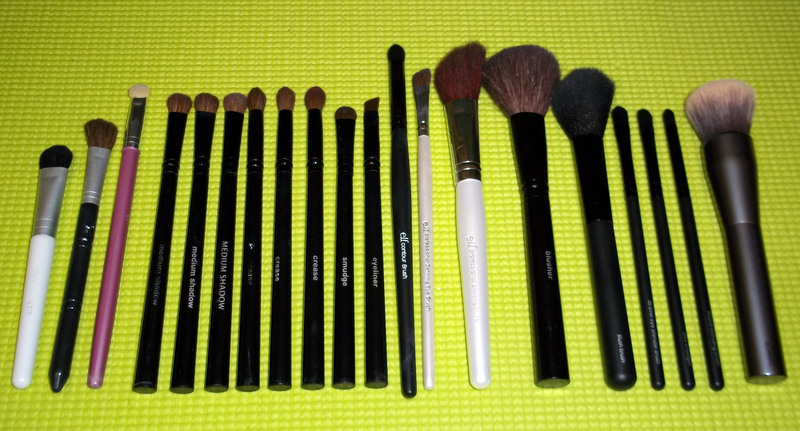 These are all of my brushes. For some of the makeup gurus out there, this may appear minimalist, but I work with what I have and am willing to spend money on. From left: Three brushes from random kits I’ve received as gifts from relatives over the years. They serve the purpose of throwing on a quick brow highlight most of the time. The pink one, I use the end to dip into my undereye concealer and then blend with a sponge (not pictured). Six eye shadow and crease brushes from Target. I have three of each to avoid constant brush washing (i.e. laziness). A smudge and eyeliner brush from Target that I hardly use but are good to have anyway. Two ELF (eyeslipsface) brushes that are also rarely used. I mostly use the white one to apply highlight to my inner eye corner. An ELF bronzer brush, a Target blush brush and a Forever 21 blush brush (which I use to apply highlight powder to my face). Three brushes from Forever 21 that came with the “blush” brush and haven’t been used since. The foundation brush from Urban Decay is the heaviest and most expensive brush I own (but received as a gift per my request). Otherwise, every other brush cost me no more than $6 each and they get the job done just fine. 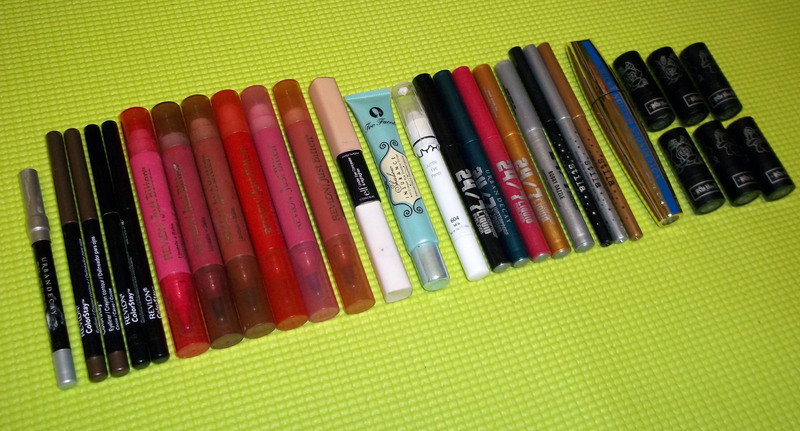 From left: An old Urban Decay eye pencil. Four Revlon Colorstay eyeliners (these are the best). Six Revlon Just Bitten lipstains that I rarely wear anymore (I’m all about tinted lipbalms now). A concealer and highlight from ELF. Too Faced Shadow Insurance (eye shadow base) and NYX Jumbo Eye Pencil in Milk (also a good shadow base). Five liquid eyeliners from Urban Decay. Three eyeliners from Stila. Mascara from WalMart, I think it’s L’Oreal brand. Six mini lipsticks from a Kat Von D kit from Sephora. Top left: Brush cleaner and a blush from ELF. The Sugarpill Heartbreaker palette. Stila In The Know palette. Lorac bronzer and highlighter. Urban Decay eyebrow kit. A sample of Urban Decay’s Naked Skin foundation. 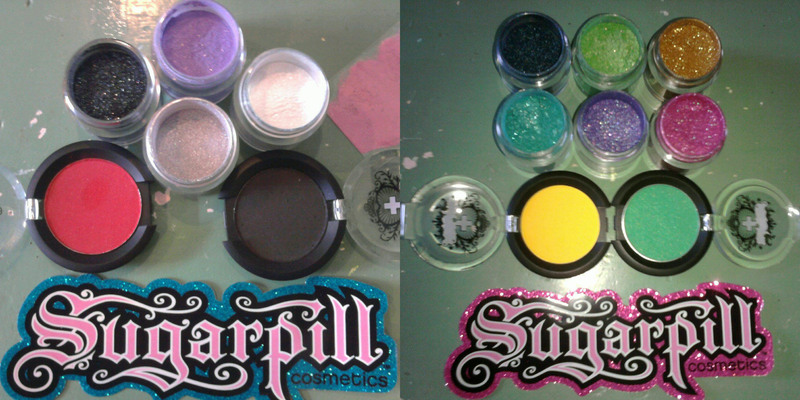 About half of my Sugarpill collection; these were the first two hauls I bought. A look I did a year or so ago. The video below is one of the first tutorials I ever watched about Sugarpill and I’ve been a fan of this makeup guru ever since. Last week I talked about how I got into makeup. However, every “how” needs a “why”. The best part about the particular time in my life that I really got into makeup is that I had finally grown into my skin. I have a simple answer for you: I do it for myself. I wear it to express myself. I wear it to experiment with color. I wear it to make my eyes pop even more than they already do. I wear it sometimes because it makes me feel and look more awake (as I am blessed with pale skin and can tend to look dead in the morning). That’s really all I have to say on the matter without boring you to death with the life story journey that got me to this point. Honestly, this lovely lady has already said everything I could say to people with negative opinions toward makeup-wearers. So enjoy! I was a late bloomer when it came to makeup. Up until I was around 19, I claimed to hate makeup and never wear it. I believed myself at the time, because all I ever saw of makeup in my high school was raccoon eyes, seeming fake for wearing it and just a pure waste of time. I wasn’t out to impress anyone by wearing makeup. I wanted more sleep in the morning. I didn’t even do my hair. (Gasp!) 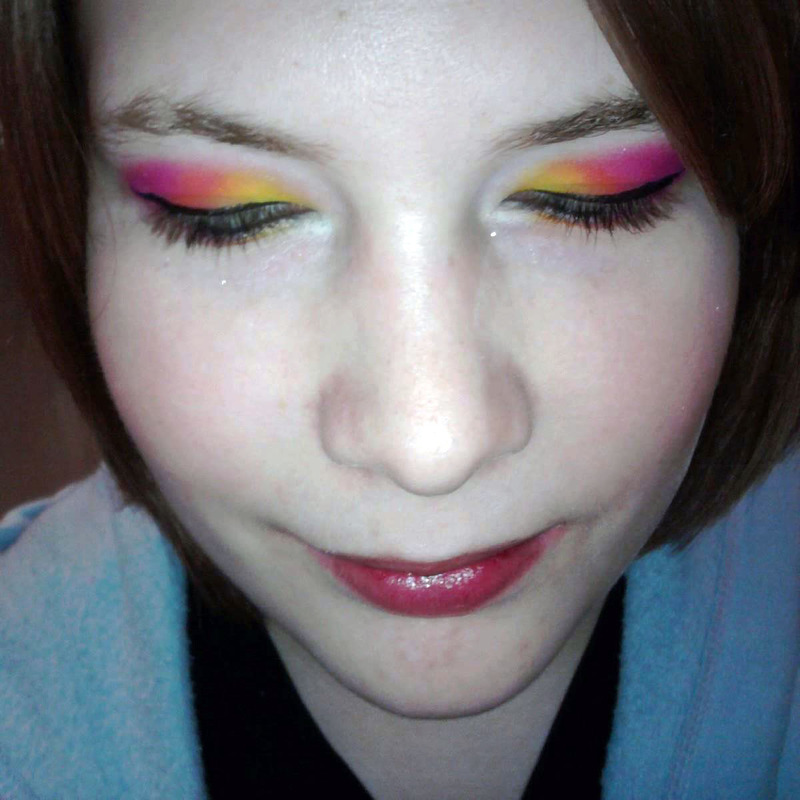 Inevitably though, I managed to collect cheap makeup sets as Christmas gifts over the years (distant relatives knew nothing of me apparently) and I tried simple things like eyeliner once in a while, but because I didn’t know what I was doing, nothing looked as good as I thought it should. So when exactly did I switch over into the world of colorful powders and face goop? Honestly I’m not quite sure. It may have stemmed from my other hobby, cosplaying (dressing up as anime, video game, etc., characters and going to conventions). People there tended to wear really colorful makeup and it looked awesome but I wasn’t quite motivated yet to try it myself. I didn’t think I could pull it off. But in a blur of finding makeup gurus on YouTube and discovering a brand that makes bright eye shadows, I found myself hooked and dove in headfirst. For a while, I just soaked up the techniques for applying eye shadow from watching makeup gurus on YouTube without actually practicing on myself. By the time I did, though, my hands knew what to do and I liked the result. Throughout my makeup-hating years, I only imagined wearing neutral makeup, should I ever cave on my beliefs. 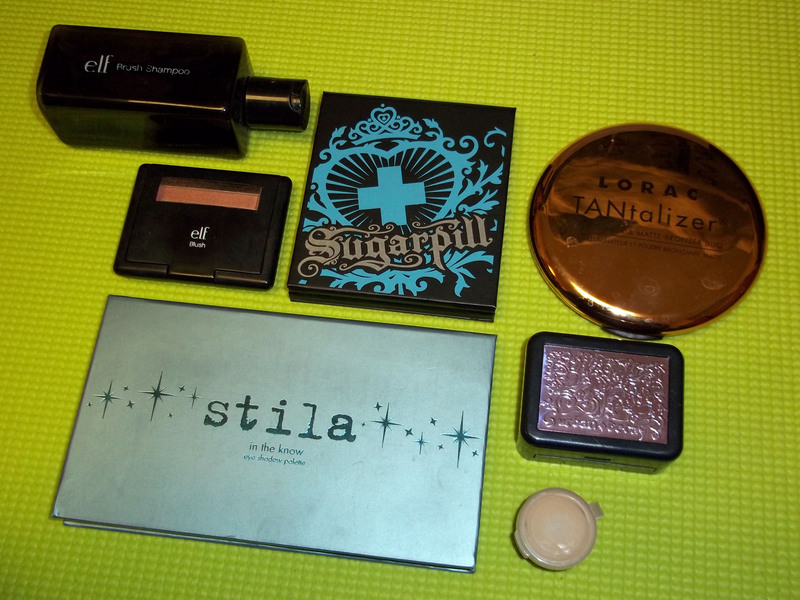 But I went straight to the bright eye shadows of Sugarpill and bought several at a time so I could start right away. I wanted to stand out and express myself through this new form of creative artistry that I could wear on my face. It was a greatly liberating feeling and it was fun. Whenever I was bored at home or was struck with an idea for a look, I would go into my bathroom and refine my skills. I didn’t have many opportunities to wear these looks out, so I took pictures and uploaded them to Facebook. My friends would comment and like the photos, which encouraged me to keep doing it (No, I’m not an attention *bleep*). So that’s pretty much my whole magical journey from hating makeup to becoming a human coloring book. 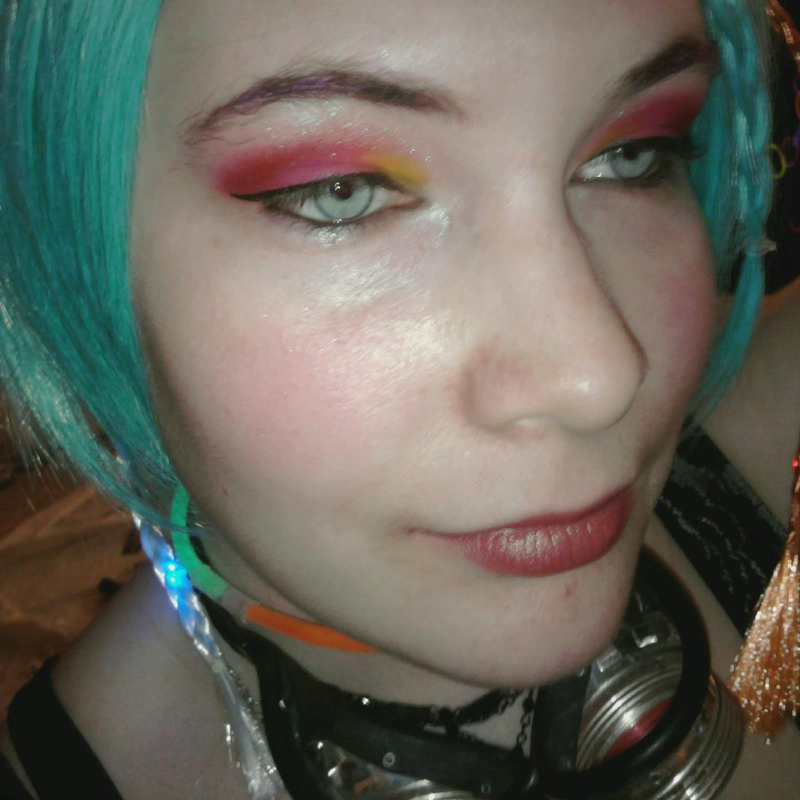 A colorful makeup look I created for an anime rave.